Lupita was domesticated as a baby, and is now about 7 years old. She is very friendly and enjoys having her belly scratched. Her previous human family had to move out of the country and could not take her along, so they brought her to us here at SIBU. Because she is domesticated she will not be eligible for release, making SIBU Sanctuary her forever home. 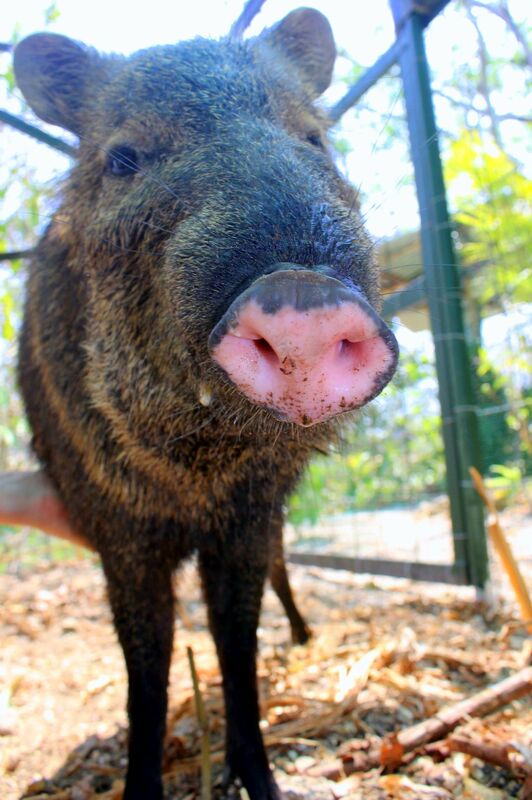 Lupita is the first peccary to be cared for at SIBU so we had to build a special enclosure just for her. Our staff and volunteers worked very hard to ensure Lupita’s enclosure would be a safe and comfortable place for her to live out her days at SIBU. Lupita is a collared peccary (Pecari tajacu), also commonly referred to as javelina, saíno or báquiro. Peccaries are pig-like mammals having coarse hair, small ears and tails and tusk-like teeth. With their long snouts, they dig the earth, feeding on fallen fruit, leaves and grass. They also have a scent gland under the skin that opens on the ridge of the back (pictured) and gives off a strong musky odor. Peccaries are generally shy and when startled they may run away and try to hide in logs or holes. They are found throughout much of the tropical and subtropical Americas, ranging from the Southwestern United States to northern Argentina in South America, as well as the Caribbean. To learn more about the other types of animals we care for at SIBU visit the Meet the Animals page.